Proudly serving Greater St. Louis, including University City, Clayton, Olivette, Creve Coeur, Chesterfield, St. Charles, Wentzville, and more! Breastfeeding advocate. Aspiring midwife. Holistic mama. Happy and Healthy Birth of Your Dreams"
The word “doula” comes from an ancient Greek word meaning woman maidservant. In our terms, a doula is someone who provides non-judgmental, emotional, physical, and informational support during pregnancy, labor, birth, and postpartum. The most important responsibility of a doula is to bring with her compassion, understanding, and faith in the body and mind of a woman. The doula knows what is typical and she knows how to provide for each woman she is supporting while allowing that woman to birth her baby her own way and to feel empowered and nurtured as a new mother. Virtually every culture in the world throughout most of history has had some form of support system in place to help women and their families through this transitional period of their lives. In our society, the doula fills the gap that was left with the disappearance of a traditional support system. What is the difference between a birth doula and a midwife? The birth doula is often likened to a midwife, and with reason, because some of their responsibilities do overlap. However, she has a different role - a different scope of practice. A doula does not perform any medical tasks. She cannot monitor the baby, perform internal exams, start an IV, nor can she carry out any other clinical tasks. The physical support a doula provides only goes as far as providing information and helping with positions, movement, and relaxation - assistance with which a midwife can also provide. 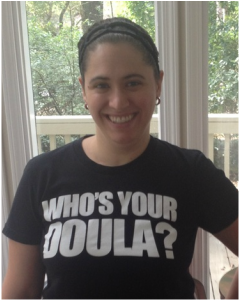 It is never a bad thing to have both a doula and a midwife on your support team. If they are both there for you, they can maximize their support and compliment each others' work with you. The purpose behind providing labor support is to empower and nurture women and their families. It is to help each woman have the most positive birth experience possible and help her feel like she is really involved in what is happening to her body. She is the one giving birth, and she should feel that way! She needs comforting support and encouragement in order to do this. Labor is hard. By providing continuous labor support, a doula can help create a positive experience and safe atmosphere for the mother and family. There is a huge psychological benefit to having labor support - it can help avoid feeling that the labor and birth were traumatic emergencies. A doula benefits and empowers a woman by providing her with the knowledge she needs to make her own choices about her body and her baby. She doesn't have to feel that birth is an illness and the doctors are the ones that need to be in control. Research has shown that having a doula not only cuts down on the number of complications and medical interventions, but it also improves bonding between the mother and her new baby. In a way, doulas are setting a nurturing example for mothers. The phrase "mothering the mother" is the perfect way to describe a doula's role. I recently heard someone say that a doula is like your mother, best friend, and childbirth educator all wrapped into one! A doula also greatly benefits the woman's family by taking some of the stress off of them, giving them information that they too need in order to feel that their loved one and the baby are safe, and by giving them opportunities and pointers so that they can be active participants in the labor and birth. I think the two main things a doula needs are 1) knowledge about normal labor and birth and 2) a nurturing and tuned in perspective. Doulas can use these to help a family member feel like they are really there and truly contributing something essential to this incredible experience. A doula makes sure that the woman in labor is getting what she needs, but she doesn't need to be getting it all from the doula herself. In fact, it can be even more beneficial for the woman to be getting what she needs from her family, who is being supported by the doula. Not only are her family members the ones who know her best and already have a deep bond with her, but they are also the ones who are going to be in her life and her baby's life long after that day of the birth. I wouldn't be surprised if this involvement also helps the partner/baby's father/family members bond with the baby as well. The doula's responsibilities include providing physical, emotional, and even psychological support to a laboring woman. The doula provides information and encouragement. She also advocates for her clients and helps them communicate their feelings/wants/needs to their care providers. She provides her continuous presence throughout active labor and birth, as well as support in early postpartum, assisting with the initiation of breastfeeding. Depending on if the doula is working privately with the mother, or through an institution such as the hospital - she may or may not be responsible for prenatal visit(s) to get to know the mother and develop a relationship/trust, and one or more postpartum visits to help the mother process her experience. The doula assists in movement and positions that facilitate both comfort and more steady labor progression; and she will use touch such as massage and counter-pressure, as well as other relaxation techniques such as breathing and visualization that help relieve pain and release tension and fear. I really believe that the most important responsibility of a doula is to bring herself, her compassion, her understanding, and her faith in the body of a woman, to each and every labor and birth she attends.